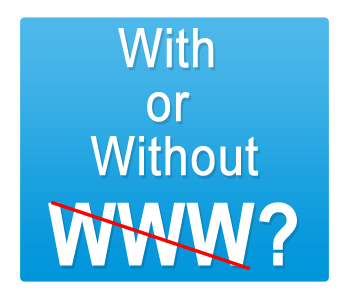 Maybe you've decided that for branding purposes you would like your domain to appear with or without the www. in front of it (e.g. http://www.example.com vs http://example.com). You put the relevant version on all your marketing literature - but how do you ensure that Google shows your preferred version in search results? In order to tell Google which version you want to show, you need a Search Console account (n.b. Search Console used to be called Webmaster Tools - and there are lots of reasons why you should set one of these accounts up!). Once you’re set up (it's free by the way), on the Search Console home page, click the site you want. Click the gear icon (top right), and then click Site Settings. In the Preferred domain section, select the option you want. And that's it - you’re done! When making the above change in Google Search Console, bear in mind that this may take some time to be reflected in the index, so you may need to be patient - so, for example, if pages are already indexed in Google then you will need to wait for a refresh on those pages before they change to your preferred version. Other than just consistency in how your site domain appears, another major benefit of deciding and specifying which version of your site you prefer is that it can also help consolidate your SEO efforts. The reason for this is that if you get inbound links pointing to both the www. and non www. pages of your site, Google may otherwise class them as separate pages and any link benefit will be split between the two. To ensure that search engines see your www. and non-www. versions as the same site, then you will also need to do a 301 redirect to point one to the other. If users then try to visit your non-preferred version (via direct type in or a link), they get automatically redirected to your preferred version. To do the 301 redirect you'll either need to talk to your web developer/webmaster or you may be able to action this in the settings section of your site's CMS. If you need help with some of the settings in Google Search Console or advice on 301 redirects, then get in touch today.